Continuation of Sailing Holiday Croatia Part I. Early morning we left, since there was some wind forecasted. You should now that if there is wind in Croatia, it often runs North West or South East. 32 nm later, we arrived at Otok Ravnik, east of Otok (island) Vis. The islands on the east gave us a good shelter from the south easterly wind and swell that ran that day. The lunch we had was great again, thanks to Magdalena's boat recipes. The swim and snorkel also, of course! Late afternoon, we moved to Viska Luka on the island of Vis. A large bay, where a lot of yachts were anchored. Did you know that the island was closed for public during the communist period and that there are bunkers where boatscould go hiding? Anyway, the island is open for everybody and is a must to see. The towns of Vis and Kut are beautiful. We anchored in front of Kut. A bakery and supermarket are at your disposal. The town of Vis is definitely a bit more touristic and commercial than Kut. Depending on the size of your boat,you have to pay an Eko tax. It's less than 200 kunaif you're smaller than 20 meters in length. In case the Bora runs in, which is a strong N or NE wind, put out some more chain. You will feel it quite good in this bay. 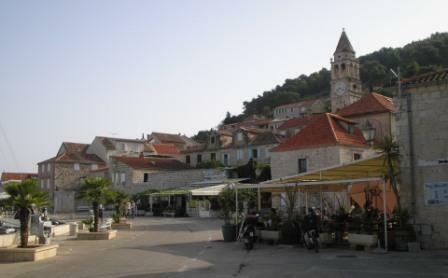 The following morning, we wanted to have a look at Hvar, the St. Tropez of Croatia. It looks indeed fancy, but there's a lot of incoming and outgoing traffic, which makes an anchorage here unbearable. Even docking here doesn't make that much of a difference. You definitely don't want to be here in a strong Bora! Instead,we anchored on the opposite side. So, we crossed the Pakleni Channel and looked for a nice, vacant anchorage. As always, the combination of a superb lunch and an afternoon swim, or even snooze, makes a perfect day in our sailing holiday Croatia! For the night, we choose a quiet anchorage 15 nm further on the island of Scedro, just south of Otok Hvar. Uvala Lovisce was the name. All yachts here were anchored with a stern line. So, come in, pick a side and drop your anchor. Spot 1 or 2 solid tree and voila, you're good for the night! We also had a visit of a guy who sold brandy, cigarettes and...bread and croissants. Bingo! Fresh croissants in the morning, delivered at 07.10 in the morning. Excellent! From there on, we motored 20 nm further to the island of Korcula and anchored on the southern side of the channel between Otok Korcula and the Peljesac Peninsula. Lots of kitesurfers, windsurfers, boats and ferries passed the channel that day. 5 nm further, lies the town of Korcula. The view is fantastic. It has its own ACI Marina, but we choose to anchor SE of the town. Korcula is a very lively place, good fun guaranteed! The anchorage we choose was very peaceful. We saw a nice monastery on the opposite island of ours, with towering mounrains behind it. 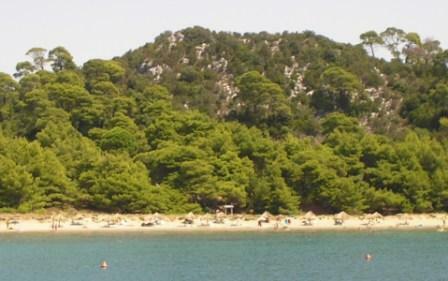 Next day, we made our way to the SE of Mljet. This part lies outside the national park. There are several nice beaches around the bay. And then, our last day of our sailing holiday Croatia. We returned to Zaton Veliki. What a lovely week and charter! I recommend chartering a yacht in Croatia wholeheartedly. Check out the latest discounts to charter a yacht in Croatia!